Thirty years of engineering design means we also offer seamless project management, accountability and reporting. 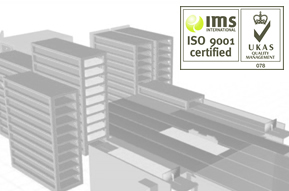 As an ISO 9001:2008 accredited company, Stacking Systems Limited has solid foundations in Quality systems that ensure the very best supply of both products and services. In the pharmaceutical arena we work to GAMP 5. Naturally, Stacking Systems design is also compliant with European standards and UK Health and Safety Legislation.